Antislip glue Grip Fix secure pallet loads I Sopack s.r.o. Sopack s.r.o. offers Antislip agent Grip Fix in order to protect your goods during handling and transport. Antislip adhesive can be applied to your goods by our machine BAG FIX in the form of beads, spray or sponge roll according to the type of package. Grip Fix is a waterbased, water-soluble and transparent adhesive. Antislip agent has high shear strength and low tensile strength. 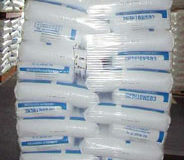 It is agreat solution for paper bags, PE bags, cartons, small packages and PP woven bags. What type of packages is our Grip Fix suitable for? Antislip glue is a great solution for paper bags, PE bags and cartons. 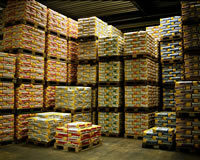 Grip Fix agent is the cheapest solution how to stabilize and secure your goods on pallets. How the Grip Fix is applied on goods? 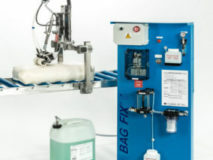 Antislip adhesive Grip Fix can be applied manually or automatically by our machine BAG FIX. Small quantities of our glue is applied directly onto the goods in your production or before final palletization. Application is in the form of bead, spray or by sponge roll. Grip Fix is a waterbased, transparent and solvent-free adhesive. It is applied in small quantities on goods before they are palletized. After a short period of drying the goods are stuck together and the pallet unit is stable and remains untill the goods are unloaded from the pallet. Grip Fix causes high shear strength and low tensile strength between the goods. Antislip adhesive Grip Fix saves you packaging costs concerning additional packaging material because it reduces the use of stretch foil, PE straps, shrink foil etc. Thanks the Grip Fix can be your packaging eco-friendly. 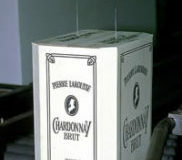 Application of the glue can be automated in your production which decreases packaging time. Grip Fix adhesive avoids the disposal of waste packaging material. Our antislip glue is 100 % recyclable, leaves no residue, is water-soluble, doesn´t tear your packaging, has zero carbon footprint and is non-toxic. Grip Fix has a Food contact certificate. It is suitable for foodstuff packaging according to BGA and FDA. Sopack s.r.o. offers more than 120 different Grip Fix formulations in order to match perfectly to customer´s needs. For this reason a sample of your packaging (paper bag, carton, PE bag etc.) and a completed questionnaire is needed. According to the sample the right Grip Fix glue will be produced in our lab. Then the TEST in your company can START. What parameters affect the final type of the Grip Fix? 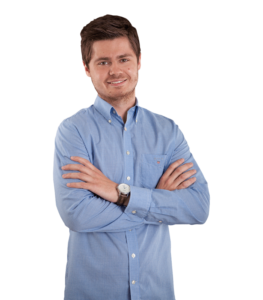 The first step of our cooperaion is to clarify, recognize and get knowledge about the processes in your company. The Production process (answers to the questions regarding the type of goods, how many layers per pallet, how many pallets you dispatch per day, temperature and dust during production etc.) The expedition process (type of transport you use, time between production and dispatching) and we have to analyze the type of packaging. We have to analyze your packaging material in our lab, than we do a testing in our lab. After testing we are able to recommend you the right type of Grip Fix antislip glue that is suitable for your products. 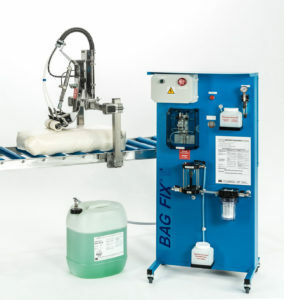 In the case of your interest in our antislip adhesive and your lab result confirmation, we install the BAG FIX machine in your production for free. Then the TEST in production can start! In the case of your satisfaction with our Grip Fix adhesive and Bag Fix machine we leave the machine in your production and deliver to you our glue in bigger packaging such as drums, IBC container etc. 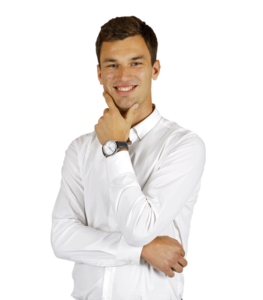 We will provide you with regular service and check the quantity of the applied glue regularly. Are you interested in our Antislip Glue TEST?